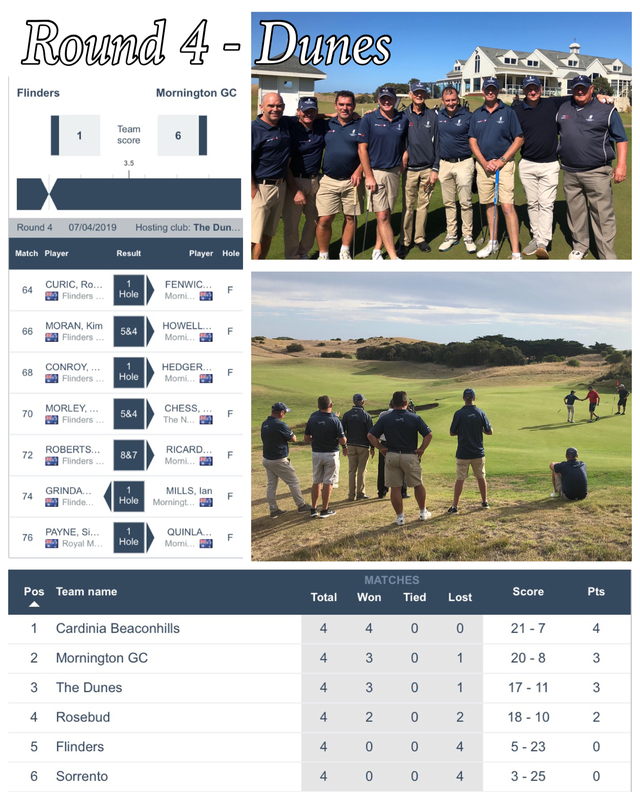 The Div.1 boys went to The Dunes last weekend looking for a solid win with a semi-finals berth in mind … It was an awesome day for golf and our Selectors- The Iceman and Gazza were quietly confident they’d chosen a Team that could deliver. After some very solid performances across the board we finished with a fantastic 6/1 win over Flinders securing ourselves a finals spot and climbing to second on the ladder. Some of the highlights this week included an impressive 8&7 win to newcomer Jamie Ricardo (at no.3 – Danielson definitely benefited from his session with Mr Miyagi )… the 3amigo’s Chessy, Chooka and Hedge hit milestones notching up 3 wins from 3 starts … both Chessy (at no.4) and Chooka Howell (at no.6) who have found their Mojo this year, finessed their way to impressive 5&4 wins … Captain Quinlan (at no.1) Hedge (at no.5) and Davey Fenwick (at no.7 in his first game this year) all grinded it out to the 18th to finish 1up … our stalwart Millsy (at no.2) battled to the 18th to finish 1down (so close but no chocolates). Awesome effort from all the boys … Let’s go to Rosebud in Round 5 and see if we can lift even further and take out last year’s “Flag Winners- Rosebud” on their home track. The boys have definitely embraced every opportunity to play this year and have developed a great camaraderie and competitive bond … It’s been great to watch it develop and I’m sure the ‘Bushwood Spirit” will continue to grow as they chase the Flag in 2019. Our Selectors have managed our list to ensure we qualified as many as possible for our finals series … and what a great job they’ve done for our Club. We’re in a strong position with 10 players now available for finals selection … so here’s to everyone maintaining their good form and continuing to build on the our momentum as the season approaches the finals series … “Go Bushwood”. This week’s selections will again see some players resting and our chosen squad members will proudly stand up to bat for “Bushwood at Rosebud CC”. After careful consideration our Selectors have named the following players for Div.1 in Round 5. Graeme Quinlan (C), Jamie Ricardo, Glenn Trimble, Grant Cheasley, Erik Chess, Paul Shirley and Dave Fenwick. Congratulations to all Players … you will be contacted via email with further details about this weekend’s matches. The Pennant Team welcomes any members, family and friends who’d like to come along and watch/ support our boys as they strive to win in Round 5 and consolidate a spot in the finals over the coming weeks.